I like Sword Art Online, I really do. I won’t say it doesn’t have problems (because it has a decent amount of them), but for the most part I’ve always enjoyed everything it has to offer. I came into season two hoping for more of the same, but sadly what we get given isn’t quite as strong as the stories we covered in the first season of the shows run. 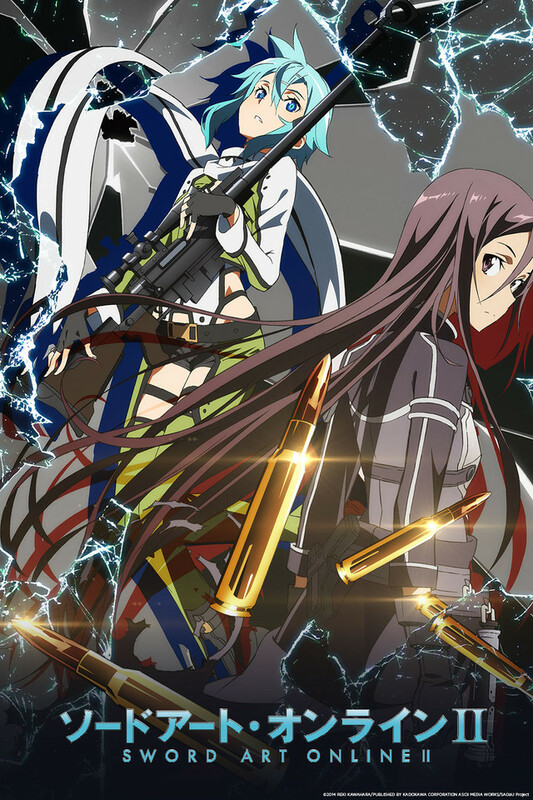 The first 14 episodes of this season cover Kirito’s time in the Gun Gale Online game where he’s investigating a mysterious killer who seems to be able to kill people in real life by shooting them with his ‘death gun’ in the game. Surely you can’t kill people from within a game, right? Well, probably not but I’ll leave that little mystery for you to solve yourself if you so wish. 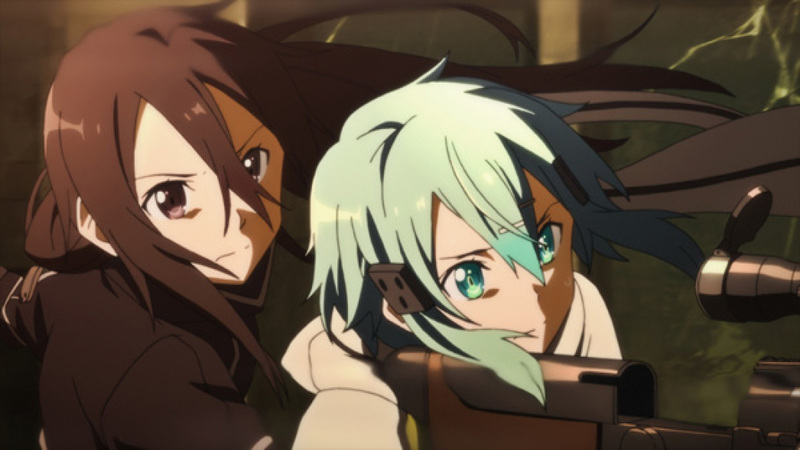 This arc of our story also introduces us to a new female character in the form of Sinon who eventually ends up working with Kirito. Gun Gale Online is an online game with its main focus on guns and shooting and is far more competitive than those we’ve seen before in the show. By taking part in tournaments and so forth players are able to earn a lot of money if they come out on top, something that none of the other games have offered. For anyone interested in FPS games or the like then they’ll likely quite enjoy this arc of our tale, but for those that don’t Gun Gale Online doesn’t really offer anything else. Kirito, as you’d expect, does end up with a sword in the form of a lightsabe but with everyone around him having guns there is no real purpose for him to have it beyond him being Kirito. A lot of the problem is that if you aren’t interested in this type of game then Gun Gale Online is extremely boring. Sinon has a fairly interesting story behind her but by no means enough to hold your overall interest in the show as for a lot of the arc she feels like a rehashed Asuna. The overriding problem with Sword Art Online, which I’ve only fully realised with this arc, is that the series is only as interesting as the games Kirito and the others are involved with. 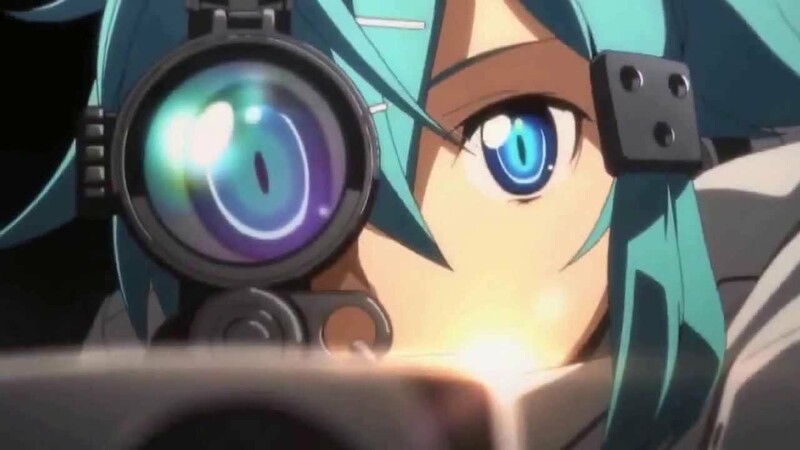 Gun Gale Online is a bland and uninteresting world for anyone not interested in that style of game and Kirito and Sinon can’t hold your interest because they’re not strong enough characters. 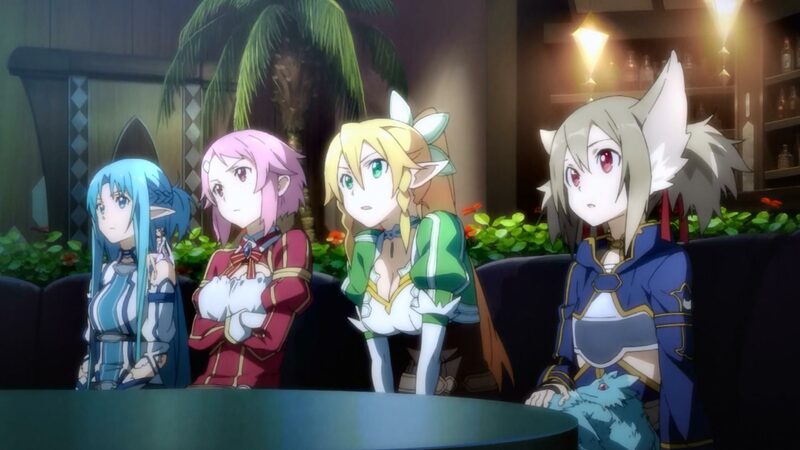 The world building in Sword Art Online has always been really loose, but overall the world of Sword Art Online and Alfheim Online are bright and colourful worlds with far more to offer to the viewer if they aren’t that keen on the characters themselves. Gun Gale Online is just not a good game, nor is the story that ties into it. The pacing overall for Gun Gale Online feels pretty horrible in places as well. Some episodes are action packed and move things along while others spend too much time on unimportant details and move far too slowly for a game with such high risks at stake for all involved. It is worth noting that there is a 14.5 episode at the end of the arc basically recapping everything that happened, so if you find yourself not liking this arc then you can watch that and carry on. This arc has Kirito riding to the rescue as a white knight and again being a mostly unbeatable character. Sure, he has an episode where he falls apart a bit, but for the most part he will likely grate on your nerves more than last season if you already disliked him to any degree. Sinon is an interesting character to a point. Her history means she wants to be strong and independent – and we do get to see this for awhile. The problem is that once she and Kirito start working together she ends up relaying on him a lot more than I’d have liked. Her character loses a lot of weight and ultimately she’s saved by Kirito much like Asuna has been in the past. I liked her character but wished the story had done more with her. There are some good aspects however. As ever the animation for Sword Art Online is wonderfully done and still stands as one of the better animated series of the shows genre. Sword Art Online once again has the wonderful Yuki Kajiura handling the soundtrack and she doesn’t disappoint. A lot of the tracks will sound familiar from the last season of the show but at the same time the new music introduced for this season is simply delightful on the ears and I find myself happily awaiting a soundtrack, or two, of it sometime soon. Crunchyroll is currently streaming Sword Art Online season 2 outside of Japan right here.